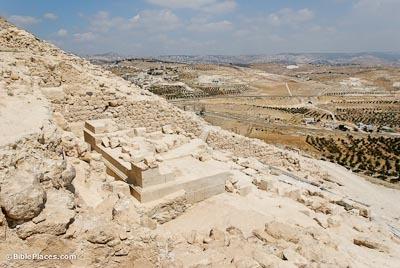 Herodium is 3 miles southeast of Bethlehem and 8 miles south of Jerusalem. Its summit is 2,460 feet above sea level. 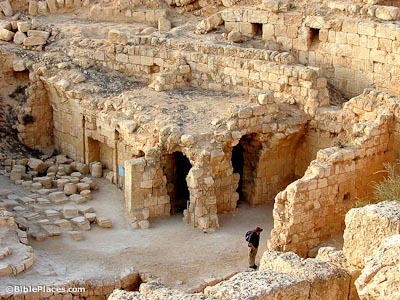 Herod built or re-built eleven fortresses. This one he constructed on the location of his victory over Antigonus in 40 BC. Constructed over a small pre-existing hill, the Herodium was a fortress for Herod to quickly flee to from Jerusalem and a luxurious palace for his enjoyment. He chose to be buried here and the mountain is the shape of a tumulus. 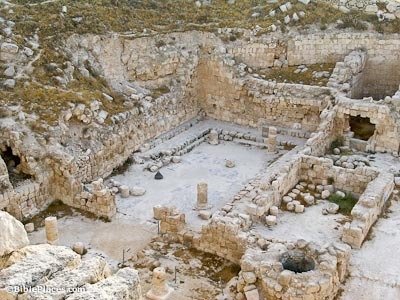 Herod’s tomb was discovered by archaeologist Ehud Netzer in 2007. For details and photos, see these posts at the BiblePlaces Blog. 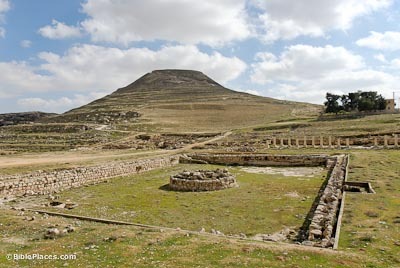 King Herod built the mountain by first erecting a double-walled cylinder with an outer diameter of 200 feet. There were seven stories in the cylinder including two or three at the top which no longer exist. Afterwards a massive fill of earth and gravel was placed against the cylinder. The four towers are located at the points of the compass. Another symbol of Herod’s extravagance in building, this full-size Roman bathhouse had the typical design of four rooms – apodyterium (changing room), tepidarium (stretching room), caldarium (steam room) and frigidarium (cold bath). The floor was paved with white and black mosaics and the walls were decorated with frescoes of many colors and geometric designs. Probably a triclineum (dining room arranged with three tables) in Herod’s day, this room was transformed into a synagogue by the Jewish rebels who took over the Herodium in AD 70. First century AD parallels to this synagogue exist at Masada and Gamla, two sites also captured and held by Jewish fighters in the war against Rome. 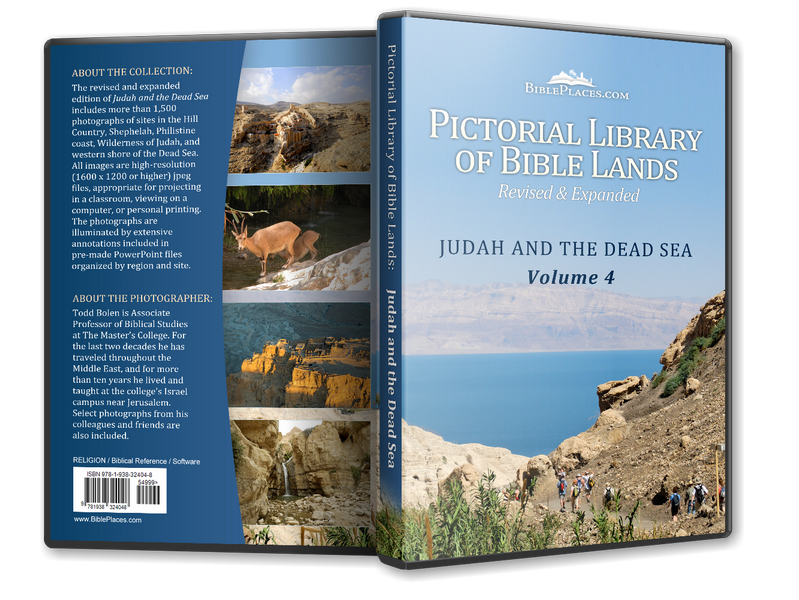 Download all of our Judah and the Dead Sea photos! Herodium (Ancient Sandals) Easy to understand introduction to the site. Herodion (Atlantic Baptist University) Large aerial photograph. Also includes basic map of area and quote from Josephus. Herodium – King Herod’s Palace-Fortress (Israel MFA) Good description of importance of the site and archaeological discoveries. The same text is posted at the Jewish Virtual Librarysite. Tomb of King Herod (BiblePlaces Blog) A series of illustrated posts on the king, the excavation, and the discoveries.